The anticipation for the upcoming seventh season of Real Housewives of New Jersey is at a real high. There's been a longer wait in between seasons than ever before and us dedicated fans are really getting anxious for some new episodes to finally air. The show hasn't even started filming yet, but fans want to know what they can expect from Real Housewives of New Jersey for Season 7. Luckily, The RHONJ cast has been all over the press and social media these days, so we can at least speculate about what we will get to watch next season. Just because the cameras haven't started rolling yet, that doesn't mean that time has stopped. The ladies have stayed pretty busy since Season 6 wrapped up, and it's been rumored that Teresa Giudice will return to the show after her time in prison. And aside from Tre, there are plenty of other things going on with the New Jersey Housewives these days. Of course, we don't know a lot of the major details about the next season yet — like who will definitely be a part of the cast and when the season will start filming — but I have some guesses about the story lines we will see on TV whenever the show returns. This is a given, but that doesn't mean it's not important. It is bound to be compelling television when Teresa returns to her four daughters during the Christmas season and they adjust to their new lives. 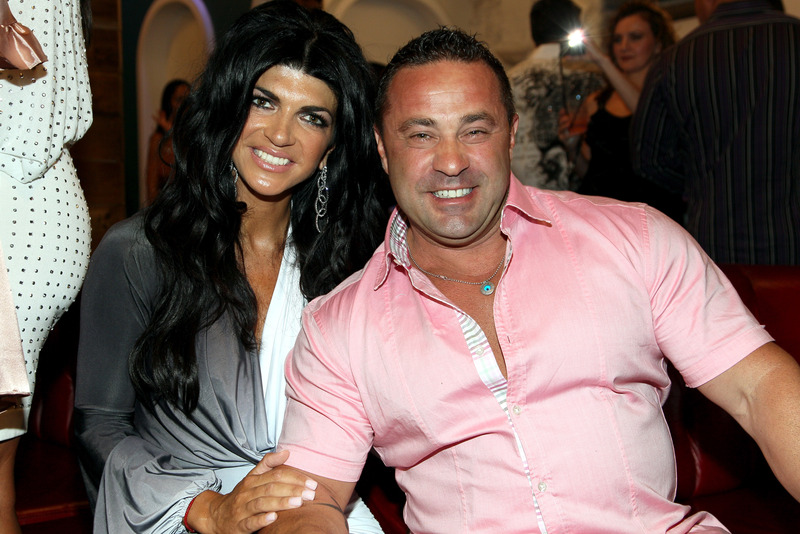 Once the happiness of Teresa's return settles, the Giudices will have to start preparing for her husband Joe Giudice's 41-month prison sentence. This family has already been through so much, so I'm sure that it will be tough to watch. Teresa may be down, but she's not out. I expect her to capitalize on her time in prison and come out swinging hard to push the books, hair care items, and food products in her empire. Teresa will do whatever she can to provide for her family and she is not going to let time in prison keep her down. I love Dina Manzo so much, but I don't get why she's on the show at this point. She won't date on the show and her daughter Lexi is hardly shown. We really don't get to see any of Dina's personal life aside from her hairless pets and some of her charity events. Melissa Gorga is starting to branch out on her own as a businesswoman. She has a new HSN jewelry line and I'm sure that she will share a behind-the-scenes look at what it takes for her to have her own collection. I hope that we get to see this different side to her. Amber Marchese is battling breast cancer for the second time, and she has been very vocal about her journey and her effort to raise funds and awareness for breast cancer research. I'm sure she will use her time on the show as a platform to share her story and educate viewers about her struggle. Nicole Napolitano and Teresa Aprea's story line last season revolved around them hating on Teresa Giudice for listening to a story that Victoria Gotti told about their mother having sexual relations with Teresa Aprea's husband, Rino Aprea. The twins continued to pick fights with Teresa Giudice and tell jokes about her legal troubles the entire last season. In a strange twist of events, the twins were since seen hanging out with Joe Giudice and grabbing dinner. So I guess this means they're all good? I'm so happy that Melissa and Teresa are on good terms these days. One reason is that I love how their adorable children will get to hang out whenever they want. I hope they show their sassy kids having play dates on RHONJ. I'm sure there will be some cute moments there. Melissa and Joe Gorga are the only couple that I like on the show. They both treat each other well and it's so nice to see that there is a strong, genuine love between them. Sure, it's not scandalous or salacious as a couple fighting, but I am a sucker for love, and these two definitely do love each other a great deal. Things can change pretty quickly in the New Jersey series, so who knows how true these predictions will be once Season 7 airs, but I am tired of waiting around and super excited to see what will happen next. No matter what happens, it is sure to be entertaining.